On 5th October 2018, a mobile medical van was operationalised to provide primary healthcare services to rural communities living in the vicinity of the SUJAN JAWAI Leopard Camp. 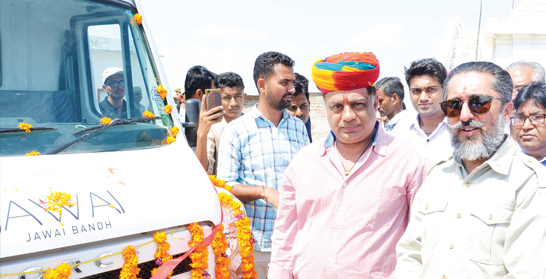 The SUJAN JAWAI Leopard Camp joined hands with the SNS Foundation inaugurated the mobile medical van in the presence of Mr. Pushpendra Singh, Minister for Power, Rajasthan. He was received by Mr. Jaisal Singh, Chief Executive, SUJAN and Director, Anand Supervisory Board. The event was organised at a local temple and was attended by the heads of villages where the van would operate as well as several enthusiastic members from the general public. Since 2014, SNS Foundation has been working in five villages in the proximity of SUJAN JAWAI Leopard Camp, addressing mission-critical areas such as education, skill development, health & hygiene and conservation. Till now, healthcare services for both the human and veterinary populations were delivered through camps where free medicines were distributed after consultations with qualified medical professionals. The newly-inaugurated mobile medical van would do weekly rounds of the villages to cater to the healthcare needs of the local populace.